Lake Erie Island Scenery Scenes in Put-in-Bay No. ___ Willow Tree Planted by Com. Perry and other survivors of the Battle of Lake Erie, to mark the burial place of the slain. 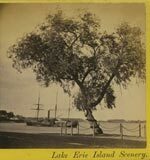 Published by Beneditct, Put-in-bay, Ohio.